← 2015 Ultimate NHL Playoff Qualifying Begins Monday!!! 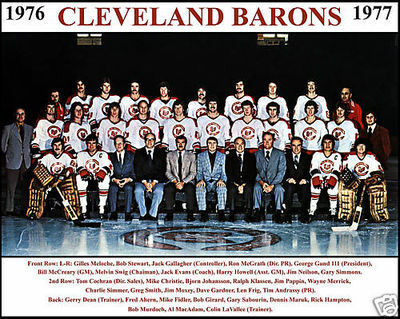 Once again, the 1976-77 Cleveland Barons will be representing the extinct Cleveland franchise in the Ultimate NHL Playoff. In the inaugural UNP, the ’76-’77 Barons were the #45 seed and will be #45 in the upcoming tournament, as well. They faced off against the #20 seed, the ’02-’03 Dallas Stars and were eliminated in five games. In this very brief qualifying tournament/series, the two teams had basically the same rosters with the same starting goaltenders, Gilles Meloche. It was a high-scoring series with the teams combining for a total of 61 goals in the six games. Many of them scored by Dennis Maruk, Al MacAdam and Mike Fidler, arguably the three most talented forwards on both teams. Below are quick summaries of every game from the series and the links are to the full boxscores for each game. This entry was posted in Qualifying Tournament, Ultimate NHL Playoff and tagged Al MacAdam, Cleveland Barons, Dennis Maruk, Gilles Meloche, Greg Smith, Mike Fidler, Qualifying Tournament, Ultimate NHL Playoff. Bookmark the permalink.